Everyone wants to make sure that their time and money are well spent. This is also true of dollars spent in pursuit of higher education. Today students attend college for a variety of reasons. Students enroll in degree or certificate programs while others strive to obtain vocational skills. Whatever your reason for attending school, you want to make sure that you are getting your money’s worth. Education is really an investment in your life and your community’s life and the more time you invest in it, eventually it will translate into a greater return. Like stocks, you cannot judge the rate of return in the short term. It is over the long-haul that we can accurately determine how our education has opened up opportunities for us that would have been impossible without that degree. A college degree gives a person the opportunity to enjoy knowledge, better job opportunities, increased health benefits, tax benefits, life changing friendships and satisfaction with life. Generally speaking, a college degree promises a certain level of knowledge gained. It implies that a college educated person has completed all the required coursework for a particular field of study. Employers, therefore, have confidence that a future degreed employee has the working knowledge of business and the ability to cope in a competitive work environment. The skill set developed by such a person is also greater than someone without a college education. Some of the key aspects of education gained are problem solving, creative thinking, social skills, evaluation, empathy, communication and reasoning skills to meet the challenges of life. If you think of education as preparation, you will have an incredible resource for life. With the advantage of attending college/university, students open up their chances of expanding their minds. In the process of meeting and befriending people of all walks of life and cultures, students begin to accept and appreciate people for who they really are. Eventually, stereotypes and discrimination fade from of their lives. This is why a college education is so important and how it plays a huge part in opening up a person’s mind. We see the significance of friendships and how these relationships are developed in a large network of acquaintances. Some of these people will share a strong bond with you for the rest of your life. These friendships may open up career opportunities in the future. Friendships become a significant benefit of college life. Earning a college degree opens up doors to greater opportunities and possibilities. This is rite of passage which helps individuals to develop self-confidence and grow as human beings. Most people believe that the more education you receive helps you to develop your mind and in the process opens up the potential to change your life. 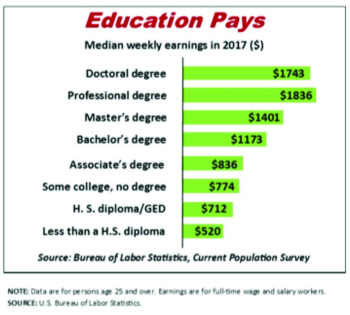 In the backlash against college, surveys have been taken that show that an overwhelming number of participants felt that a post-secondary education is more than just a paycheck. Education does many things but more importantly it empowers a person to think, question, and see beyond the obvious. Education broadens our horizons and gives us a better understanding of the world around us and how it works. Education will help you to realize your potential and allow you to reach for the sky. Are you are interested in a life changing opportunity? Higher ED can help discover what it takes go to college. You can contact Higher ED staff at 360-716-4888 or email us at highered@tulaliptribes-nsn.gov. This entry was posted in Education, Tulalip News by Kim Kalliber. Bookmark the permalink.